Every year there are elections that are decided by a handful of votes. This happens far more frequently than one might guess statistically. It may be unlikely that an individual's single vote will determine the outcome of elections, but it may still add marginally to the set of votes needed to gain a majority. The above quote comes from a piece written by the Washington Post's Julia Maskivker arguing that we as Americans have a moral duty to vote. In the United States, only citizens can vote in federal and state elections. 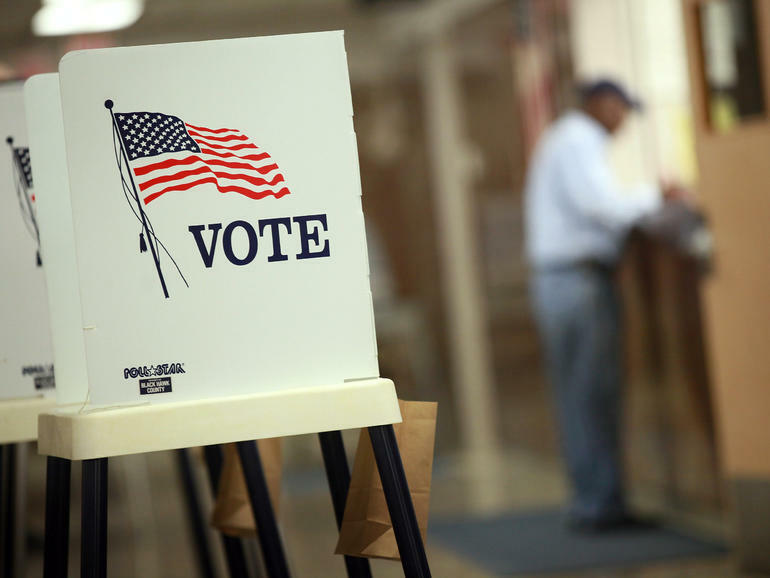 There are a handful of towns that allow noncitizens, including illegal aliens, to vote in local contests such as school board and municipal elections. According to 18 U.S.C. Section 611, it is illegal for anyone other than a U.S. citizen to vote. In an effort to encourage more Americans to register to vote, Congress and then-President Bill Clinton enacted the National Voter Registration Act (NVRA) in 1993. Commonly referred to as "Motor Voter", the law mandates that "states provide individuals with the opportunity to register to vote at the same time that they apply for a driver's license or seek to renew a driver's license." The law also directs states to "offer voter registration opportunities at all offices that provide public assistance and all offices that provide state-funded programs primarily engaged in providing services to persons with disabilities." Since the NVRA's passage in 1993, the number of registered voters has increased every year. According to the Bipartisan Policy Institute, the share of the voting-age population that is registered to vote has increased from 68.4 percent in 1992 to 70.0 percent in 2012. Politico reported that over 200 million people were registered to vote before the 2016 election. Certainly, the NVRA simplified the process for registering voters by allowing individuals to register when they applied for driver's licenses. For practical reasons, states do not differentiate licenses between citizens and aliens. Plenty of legal immigrants apply for and receive licenses every day. While they have equal access to a driver's license, legal immigrants, as non-citizens, do not have the right to vote. But due to the NVRA, almost all of them were presented the opportunity in their license application to register to vote, and many (often mistakenly) selected that they wanted to be registered to vote. This process usually involved simply checking off a box on the application, which was then sent off to the state board of elections. Often, the fact that an individual was an alien was lost in translation, and many were mistakenly registered to vote in federal and state elections. To understand how common this mistake is, as recently as this month the California DMV discovered that 1,500 legal immigrants were registered to vote within a span of only five months. My colleague Dan Cadman wrote on this occurrence. There have been a number of accounts that detail alien voting fraud and its impact on the electoral system. While this is hardly a full review of all instances, the following cases highlight the need to address alien registration and voting. 2008 Presidential Election. A 2014 article published in the journal Electoral Studies found that "non-citizen voters likely gave Senate Democrats the pivotal 60th vote needed to overcome filibusters in order to pass health care reform." The report also noted that "there is reason to believe non-citizen voting changed one state's Electoral College votes in 2008, delivering North Carolina to Obama." The researchers focused on the North Carolina presidential tally as well as the senate race in Minnesota. By comparing non-citizen turnout to the vote margin needed to win the elections, they concluded that non-citizen voting likely won the elections for the Democratic Party candidates in both instances. Referring to the North Carolina election, the authors wrote that "it is likely ... that John McCain would have won North Carolina were it not for the votes for Obama cast by non-citizens." They described the Minnesota senate election as one of the most important congressional races in that election cycle, given that it ensured a 60-vote filibuster-proof Democratic majority. Notably, the vote was decided by only 312 votes. Highlighting the razor-thin margin in which candidate Al Franken won, the authors wrote that "participation by more than 0.65 percent of non-citizens in MN is sufficient to account for the entirety of Franken's margin. Our best guess is that nearly ten times as many voted." Furthermore, the authors found that many non-citizen voters were able to vote even in states with strict voter ID laws. They wrote: "the fact that most non-citizen immigrants who showed identification were subsequently permitted to vote suggests that efforts to use photo identification to prevent non-citizen voting are unlikely to be particularly effective." They suggested that strict voter ID laws are not a hindrance to non-citizen voting because many are regularly given government-issued ID such as driver's licenses. The findings presented in the report are alarming. The report's allegation that major elections were decided by the votes of non-citizens is deeply troubling and an indication that something in our system needs to change to keep aliens from deciding the outcome of elections. Public Interest Legal Foundation. The Public Interest Legal Foundation (PILF) is a law group dedicated to ensuring election integrity. They published two reports detailing the specific instances in which aliens were registered to vote. The first, from August 2018, details how at least 3,100 aliens were registered to vote in 13 different sanctuary jurisdictions between 2006 and 2018. The "Safe Spaces" report noted that "detection and removal of noncitizen voters [was] generally dependent on the noncitizens self-reporting their ineligible status at the risk of immigration jeopardy and even deportation." This report suggested five solutions that would close off the voter registration system to aliens, including building better information-sharing procedures with DHS to prevent ineligible applications from proceeding. 5,556 non-citizens have been removed from the voter rolls for citizenship problems in 120 of Virginia's 133 voting jurisdictions since 2011. In 102 of these jurisdictions, 1,852 individuals cast 7,474 ballots before election officials cancelled their registrations. In the other 13 voting jurisdictions, election officials have not removed a single record from the voter rolls because of citizenship problems in over 6 years. The report concluded by stating that "Each of these individuals can make their way onto the voting rolls by simply checking the wrong box during a visit to the DMV. The true extent of the problem likely runs in the tens of thousands, if not more." Again, this report highlighted the same issue found in the ODU-GMU study. Both reports found that it is fairly easy for non-citizen aliens to inadvertently become registered voters when they apply for driver's licenses. North Carolina Department of Justice Case. The Justice Department charged 19 aliens accused of illegally voting in the 2016 election. A New York Times piece said that the accused "were confused about their eligibility to vote." This was likely due to a lack of education and awareness around the fact that non-citizens, even those with legal permanent residence (green card) status, cannot vote in federal and state elections until they become citizens. Increased education on this point was one of PILF's suggested solutions for curbing voting fraud. Heritage Foundation Voter Fraud Database. The Heritage Foundation, a conservative think tank, maintains a list of election fraud cases, including instances of ineligible voting and false registrations totaling 400 cases. Jason Snead, an analyst at Heritage, surmised that "no one's interests, Republican or Democrat, liberal or conservative, are served by noncitizens casting fraudulent ballots, candidates for office cheating their way to victory, judges overturning elections because of falsified ballots, or any of the other schemes identified in the Heritage database." He noted that the Heritage database is not a comprehensive account of every single case of voter fraud and that the actual volume of voter fraud is significantly higher. In September, House Majority Leader Kevin McCarthy introduced House Resolution 1071. The resolution called for the recognition that "allowing illegal immigrants the right to vote devalues the franchise and diminishes the voting power of United States citizens." The resolution passed with 279 votes. Incredibly though, 72 members voted against this resolution, with a further 69 voting present rather than taking a side. Many claim that alien voting fraud is not a problem, or that it is so rare that it does not affect electoral outcomes. The Brennan Center for Justice published a report declaring voter fraud to be a "myth". Giving even a cursory glance at these examples reveals that it is hardly a myth. A published academic article argues that non-citizen voting likely swayed two pivotal 2008 elections. The Public Interest Legal Foundation suggested that the election of Virginia's attorney general in 2013, decided by only 164 votes, may have been decided by non-citizen voters. Following the 2016 election, the Department of Justice charged multiple people in North Carolina with illegally voting. The recent case in California shows that thousands of aliens can be accidentally registered to vote on a regular basis. Lawmakers must begin taking seriously the reality of non-citizen voting. The National Voter Registration Act (Motor Voter) is flawed in that it has made it significantly easier for non-citizens to access the ballot. Revisions must be considered to motor voter in order to prevent entirely the registration of non-citizens. HR 1071 is a start, but it is only a resolution. With this in mind, both Congress and state legislatures should work together to correct this significant problem and restore integrity to our voting system.